When I first toured Champlain College, I knew inherently that this was the type of environment I wanted to be a part of. One of the many reasons why is the college’s continuous efforts to creating a safe and open environment for all of the individuals in their community. A big way that Champlain does this is through events like the Women’s Empowerment Symposium. The college came together in its second annual year to spark conversations about gender with individuals ranging from the student body all the way up to the president and his cabinet. 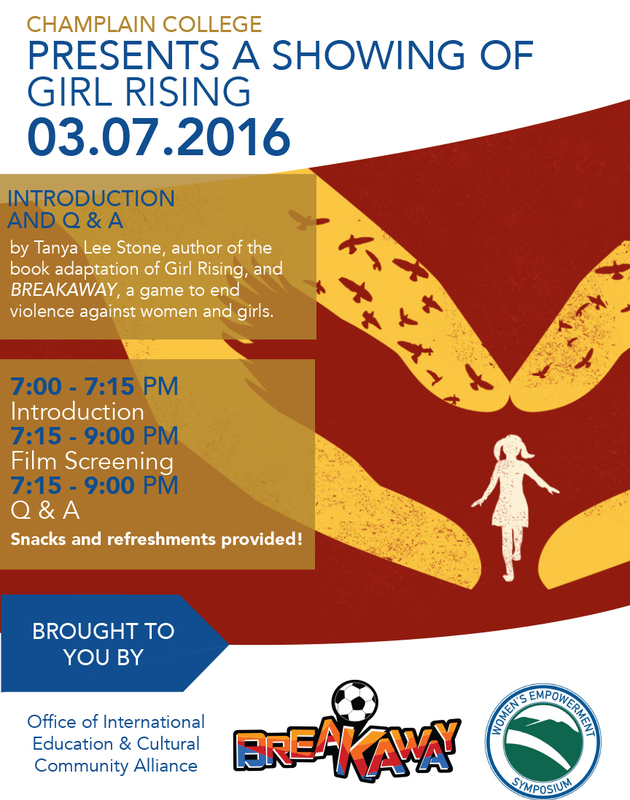 During the day long series of events BREAKAWAY had the pleasure of hosting the showing of the film Girl Rising. I was unfamiliar with the film, but was soon taken by the stories of the nine girls around the world. Girl Rising tackles the gender inequality of education from the perspective of the ones who are not given the opportunity. The nine individuals being followed by Richard E. Robbins and his crew are just a small representation of 60 million girls and counting that do not have the opportunities that we at Champlain College have been privileged to receive. As an individual that aims to be a source of support to my fellow women, I really appreciated this movie’s attention to the perspective of younger girls. So often younger females are among the least powerful and the least supported in speaking up for themselves. Girl Rising has rejuvenated my gratitude towards the environment I was raised and the one I live in now. I am infinitely thankful that I have been given the chance to learn and be empowered to find my own voice. For those that struggle in those areas or those that have been intentionally refused those opportunities, I am glad that others are hearing their plight. Girl Rising is just the tip of the iceberg! There is First Lady Michelle Obama’s campaign Let Girls Learn that seeks to provide governmental support to push girls to seek out and complete their education, and Plan International’s global initiative Because I am a Girl that creates sustainable projects in developing countries to give girls access to the most basic of human rights including education. Yet we cannot just assume that the biggest campaigns and initiatives will do all the work. On a lower level we must support those efforts. As one person it is hard to feel as though your voice matters, but it does! As a member of leadership in the Stiller Women in Business, we have made so much progress on campus despite the fact we are a newer and smaller organization. Even in the classroom you have opportunities to be a leader and support females regardless of whether or not you are one. Give your female classmates the space to talk, seek their perspective, and acknowledge the female difference as a place of opportunity rather than a place to be divided. It is a pleasure to work at a studio like the Emergent Media Center that produces video games like BREAKAWAY, which aims to deter violence against women from a young age. While I did not have a hand in developing this game, I know that being at the EMC is a small way to be a supporter for the cause of gender equality. Every time I tell others about my job, I proudly tell them about BREAKAWAY and know that spreading the word sparks a conversation and hopefully a movement towards making the world a place for all of us to thrive.